Interoperability is real. It's not happening everywhere and with everybody, but it is happening. I would love to see ONC post a blog on their website asking folks where they see interoperability occurring. We have so much "fake" news out there today it's hard to see what's real. A CBS journalist made a really good video about "Astro Turfing" in the news and she's right. Granted there's a little push in there for CBS, but not bad as she sticks to the content. News rigging has arrived:) We can't tell what's real and what's fake out there and as you pointed out with Information Blocking comments, it's a made up story. There's more of it out there as we enter into the financial areas. News feed bots drive stock trading bots as we know, now add on journobots that react to the stock bots and bingo within a few minutes or seconds, we have all kinds of news created to potentially manipulate stock too by creating an alternative view, commentary or whatever. The circle repeats itself as that story now feeds stock bots and the cycle starts all over, and so it goes. It's pretty scary and we have the same type of hype and fake grass roots and Astro Turfing in Healthcare, as many of the products in Health IT of course are traded on the market too, and of course that might make a case for all the fake grass roots we see in that area. I saw the USA today story and just kind of shook my head. They just don't get it. As Mark Twain said, "It's easier to keep fooling people than convince them they've been fooled"
Here's the TED video and it specifically addresses big pharma fake campaigns as well. It is nice, though, to see this critical, although somewhat "deeply geeky" issue make it to the nation's newspaper of record. Your comments are excellent. There is no question we are in the trough of disillusionment regarding EHR interoperability. What we need to keep in mind is not the implementation of standards, the building of more data respoitories, new congressional committees or policies. Although all of these are important, they are at the system-level and attempting to find a single solution to everyone's needs. In the trenches, during an office visit or in the ICU, we are still juggling paper, verbal and multiple applications to be navigated as we search for and attempt to piece together patient data in order to care for our patients. We are dependent on the technology to redesign processes that work locally while meeting global requirements. 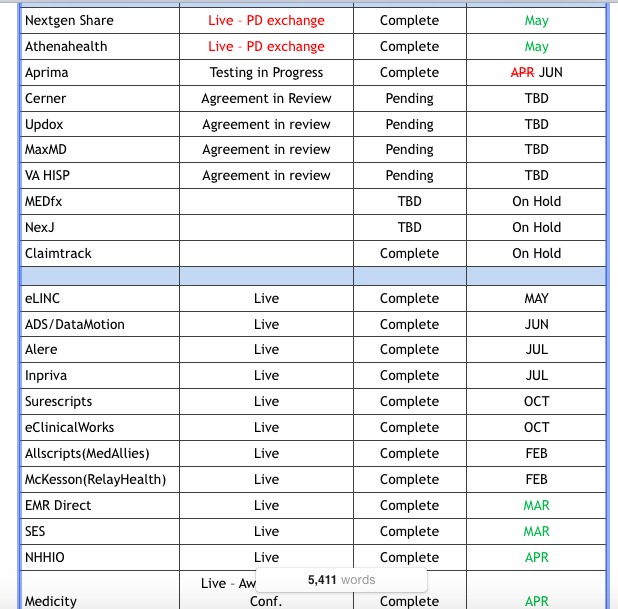 There is no question HIE's and pilot connection projects have been demonstrated with many EHR's, but the real question is do we have a framework of health IT development where solutions and workflows developed for one system can be used in another? Technology adoption in fields outside of medicine have cycled through a similar adoption/frustration curve, however, they have reduced costs and brought efficiencies because of this ability. In the trenches, we are using proverbial ductape and for lack of a better word, hacks, to connect information and being forced to adopt process and workflow to meet the constraints of technology, instead of the more efficient and effective inverse. Although I agree with the overall premise of this post, we all experience frustration with change and the adoption of new technology, I think we need to take a step back and look at how we can extract the benefits of technology we have implemented. I envision a health IT ecosystem where developers are easily able to develop on top of a framework and not limited by the technical designs and data models of an individual system. We must be careful as we highlight hacks to getting things done if they are not easily translated to the the clinical realm where physicians and patients are struggling with inefficiencies to accessing and more importantly using the data being gathered. Although the frustrations are not being heard as loudly, there are a great deal of issues we still need to address in order to develop clinically relevant solutions to improve care delivery. I recently heard a CEO state 'why are my printing and toner costs continually increasing now that we have system-wide EHR adoption?' Solving problems with technology is hard. Without a framework where standardized development can occur and be shared between institutions and EHR's, we are unlikely to realize financial, quality and efficiency gains from these systems. Looking at health IT from the perspective of other industry, there is ample support for implementation of a interface level such as middleware to address the issues we are dealing with. This perspective does not negate EHR's but instead brings the ability to enhance them in a uniform way where solutions can be shared between providers, institutions and allow customization that is now not possible. The future for a connected and distributed health system is great if we think beyond the current limitations and imagine how to solve these grand challenges in a scalable and cost-effective manner. Technology costs in medicine will decrease as we shift our focus from enterprise software architecture to service oriented design, a validated, effective, more cost effective and rapid developmental model. Good post, John. I empathize and can relate to the difficulties dealing with criticism that is partly misinformed. Of course, there have been plenty of legitimate problems to criticize re interoperability, but the problems are seldom solved as quickly or simply as people would like, such as by passing new laws or forming new committees. I hope you will continue to be a public voice for progress, reason, and fairness, ever when your term on HITSC ends. Many healthcare IT leaders lack a comprehensive understanding of what exactly they implemented with their Direct-enabled Meaningful Use Stage 2 certified system, even if they have successfully completed their attestation (and even more so if they are behind, which is the case for many independent practices). Sadly their is no requirement that you make a meaningful exchange of health information, only that you exchange it. I live in a geographic region without an HIE, and what I see most often is organizations purchasing an isolated pseudo-HIE for their own physicians (dbMotion), setting up accounts for their physicians that they may/may not ever use, then sending a CCDA to the physician inbox to meet the MU2 requirement. A physician could log in to look at the data, but generally these physicians already have remote access to the EHR directly so typically it's an exchange to nowhere--a huge missed opportunity that has nothing to do with a lack of interoperability standards. Vendors share some of the blame here as well. Our EHR vendor has been so focused on getting everyone upgraded onto the certified EHR system that no effort whatsoever went into guiding the optimization process so we could benefit from new tools, like the ability to import structured data from a CCDA (available in all certified systems and rarely used). 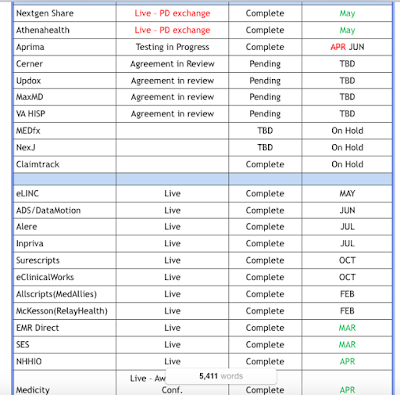 Of course if we really get into why upgrades take up half the year then I think we'd start truly seeing the main EHR platforms are not sustainable if the goal is to optimize interoperability and other key areas...how can you effectively optimize if 4 - 6 months of every calendar year is dedicated to routine system upgrades?